Whether you're a brand devotee or a beauty blogger looking for an excuse opportunity to try some new products there is nothing better than a gift with purchase offer. Right now Clarins has a rather fabulous gift with purchase online at Debenhams*. until Sunday 7th August. 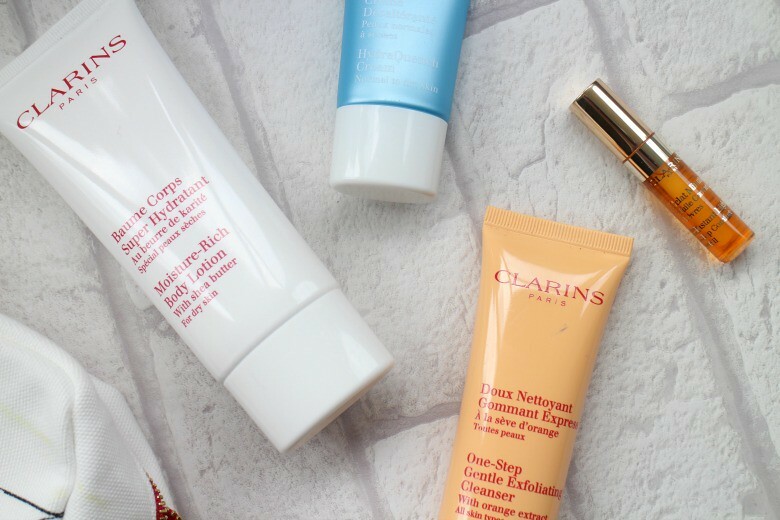 As is typical with such offers you're required to make a purchase of two or more Clarin's products before you receive your bag of goodies, at least one from their range of skincare - my pick would be Clarins Beauty Flash Balm which you'll have recently seen in my monthly favourites. Your Clarins Gift with Purchase includes, and is held within a pretty beauty bag which is the perfect size for holding all your Clarins products ready for any forthcoming holidays. Inside you'll find Clarins One-Step Gentle Exfoliating Cleanser 50ml* which is a deliciously orange scented product. This cleanser made it's way in my Empties way back in 2014. It's a gritty gel like texture which is ideal if like me you can be lax with your skincare regime, skipped a mask or two and need something to freshen up the skin. It's perfect for holidays if you are a fan of tanning and need to ensure any dead skin is sloughed away - just remember SPF. I've been enjoying this recently targeted around my nose where blackheads tend to gather, especially from wearing sunglasses since the sun has appeared in the UK. Next you'll find a 15ml size of Clarins HydraQuench Cream* which I'm tucking away for my next long haul flight as this will be perfect to ensure my skin stays hydrated during the flight so I can arrive to my desitination looking radiant even if jetlag is starting to kick in. It's worth exploring the HydraQuench range to make up your qualifying purchases whether it's the Clarins HydraQuench Cream Mask which I enjoy using overnight, especially when I'm hungover or Clarins HydraQuench Replenishing Lip Balm which Lupita Nyong'o had to hand the night she won her Oscar. Your final two products are for that extra bit of pampering, Clarins Moisture Rich Body Lotion* and a Mini Instant Light Lip Comfort* the latter being the product I'm keen to try once I rid myself of a pesky cold sore. The lip treatment has a non-sticky, lip plumping formula which has made itself rather popular on other blogs. If you're keen for some more suggestions on what to buy from Clarin's then another favourite of mine is the Clarins Bronzing Duo; this is a product I actually hit pan on and repurchased which says alot! See it in action here. If you want to pick to take advantage of this offer you can order online at Debenhams right now. Thats my favourite brand and Im nearly out of moisturiser - guess where Im going eeek! !